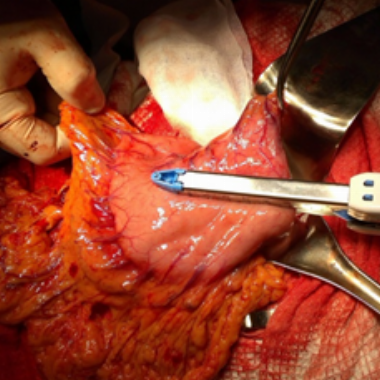 In the case of esophageal anastomotic leakage it is possible to use a conservative, endoscopic and surgical treatment. Esophageal anastomotic leakage remains one of the most serious complications in esophageal surgery. Despite all the modern pharmacological, surgical and anesthetic arsenal finding effective minimally invasive methods of prevention and treatment of esophageal anastomotic leakage remains actual. In the case of esophageal anastomotic leakage it is possible to use a conservative, endoscopic and surgical treatment. We analyzed the results of surgical treatment of 4 patients with esophageal anastomotic leakage after esophageal resection or extirpation with developed one-stage esophagogastroplasty method (transhiatal access with the formation of a single anastomosis on the neck). 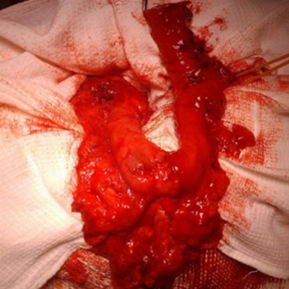 49 patients with esophageal extended postburn strictures had undergone esophageal resection or extirpation with transhiatal esophagogastroplasty. They were treated in 2012 - 2016 years in the department of diseases of the esophagus and gastrointestinal tract SI "V.T. Zaitsev IGUS NAMSU". The average age of patients was 42,3 years (from 32 to 55 years). Treatment of esophageal anastomotic leakage does not lose its relevance and it requires an individual approach. Formation of the anastomosis in the neck in patients with transhiatal esophagogastroplasty prevents such serious consequences as pleurisy, mediastinitis, empyema, pneumonia, peritonitis and others in the absence of anastomoses in the abdominal and pleural cavities even in the case of anastomotic leakage. Esophageal anastomotic leakage in the neck after esophageal resection or extirpation with developed one-stage esophagogastroplasty method does not require the using of endoscopic or surgical treatment. The advantage of transchiatal esophagogastroplasty is a posibylity of highly successful conservative treatment of anastomotic leakage. State Institution "V. T. Zaitsev Institute of General and Urgent Surgery of National Academy of Medical Sciences of Ukraine"